A one-time price of $3,500.00 will be added to your order. *A handling fee of $35.00 per item will be added to your shipping total at checkout. Product can be 1/4" to 4.5" in height if pressure arm is used! If no pressure arm is used unlimited height. All Flat-Matic purchases INCLUDE the Rewind-o-Matic at no extra charge. 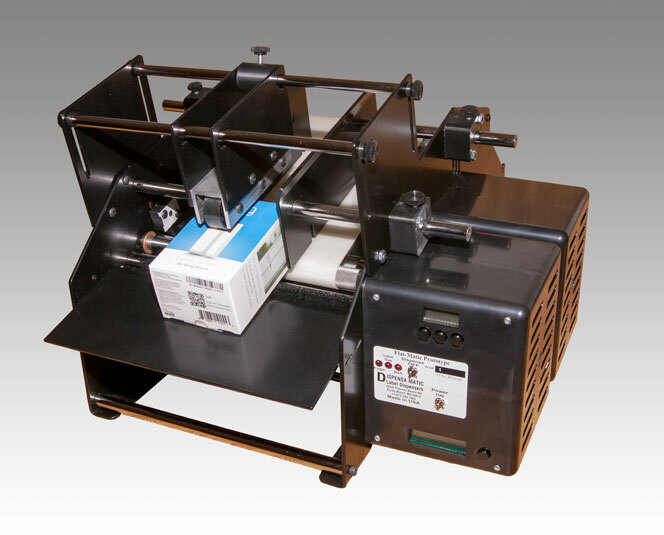 PRIOR TO ORDERING: It is HIGHLY recommended that you send in sample containers, and a roll of labels in for testing. We will provide a video with your product and labels in a real world test. If interested in sending in test samples please call or email: Info@dispensamatic.com so we can provide instructions on how to do so. *A full 3 year parts and labor warranty covers each unit against manufacturing defect. We provide full service and parts at our plant if needed. Only limited service is ever necessary. *21 Day Trial is offered on retail,direct from manufacture units only. Limit one per customer. Payment to be made by credit card. Refund will be issued once machine has been received back in its original box and in like-new condition. Shipment is usually made by UPS, but when requested we ship Federal Express, Express Mail, Air Freight, or other expedited dispatch. Shipment is FOB, Rocky Mount, MO. We accept Wire Transfer, VISA, MASTER CARD, American Express, and Discover.